Sulzer’s cutting-edge solutions for separation processes are supporting the pioneering EU-funded project ‘Steelanol’, which aims to turn carbon-rich industrial emissions into bioethanol fuels. By winning this contract, Sulzer is further strengthening its reputation in providing high-quality, reliable and innovative process engineering services and equipment for more sustainable and efficient processing plants. 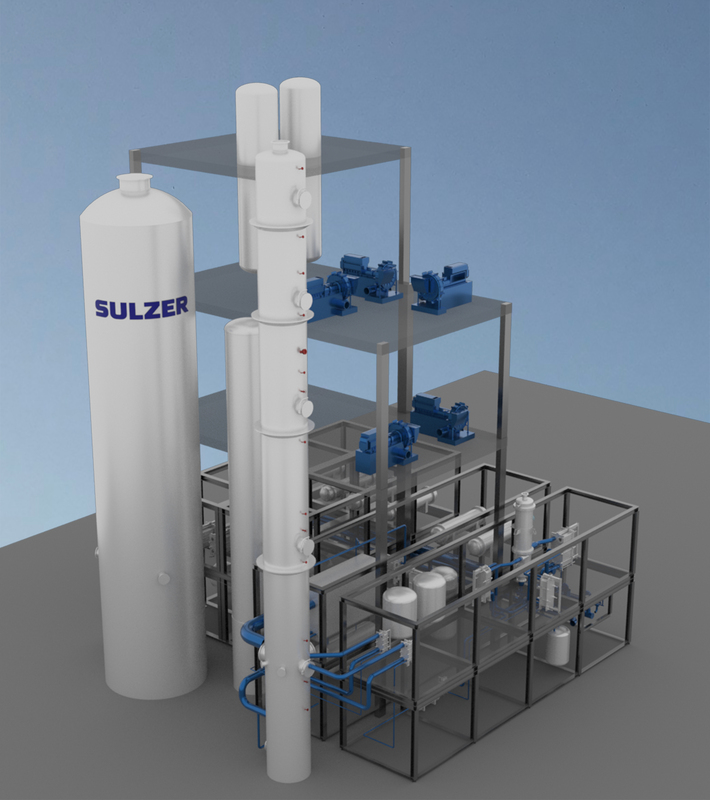 Sulzer Chemtech, the leader in separation and mixing technology, was appointed by ArcelorMittal to provide distillation equipment to its steel production plant in Gent, Belgium. This will help converting waste gases from the steel manufacturing process into approximately 80 million liters of bioethanol annually. While the steel industry is one of the biggest sources of carbon emissions, the world’s leading integrated steel and mining company ArcelorMittal is actively engaged in the Steelanol project to turn its sites into smart carbon plants. To do this, the company has partnered with LanzaTech, a developer of a biotechnology that uses acetogenic bacteria, which is able to ferment carbon monoxide (CO)-rich gases to produce ethanol. The overall carbon footprint balance is a crucial aspect for Sulzer and ArcelorMittal. In fact, for a successful breakthrough process, it is necessary to reduce any energy consumption, rather than increase it. To do that, Sulzer proposed and designed a first-of-its-kind solution that simplifies the process and the equipment necessary, whilst creating closed loops that can re-use key resources and dramatically reduce energy usage. Image 1: Sulzer have been appointed on the basis of its extensive expertise, in-depth knowledge and manufacturing capabilities for the processing industries. Image 2: Sulzer are supporting the pioneering EU-funded project ‘Steelanol’, which aims to turn carbon-rich industrial emissions into bioethanol fuels.